The panoramic view of the city from the Trigonio Tower dazzles at any time of the day. 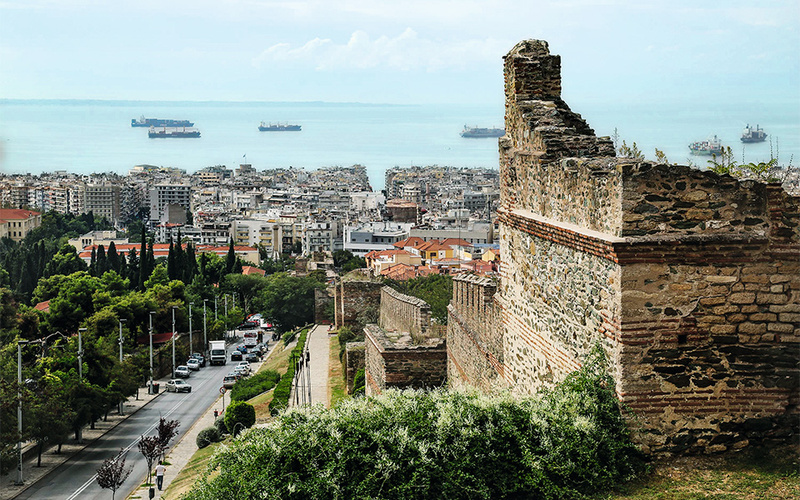 Ano Poli, an enchanting mix of stone-paved alleys, traditional houses, and impressive Byzantine and Ottoman-era monuments is Thessaloniki’s most cohesive and colorful neighborhood. 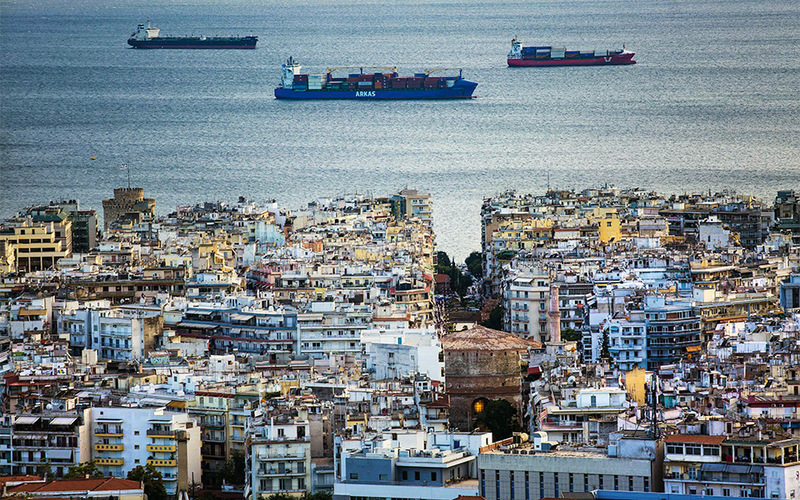 Thessaloniki’s distinctive identity derives from a few choice things. There’s rebetiko music and there’s tasty mezes (appetizers), often both enjoyed at the same time. 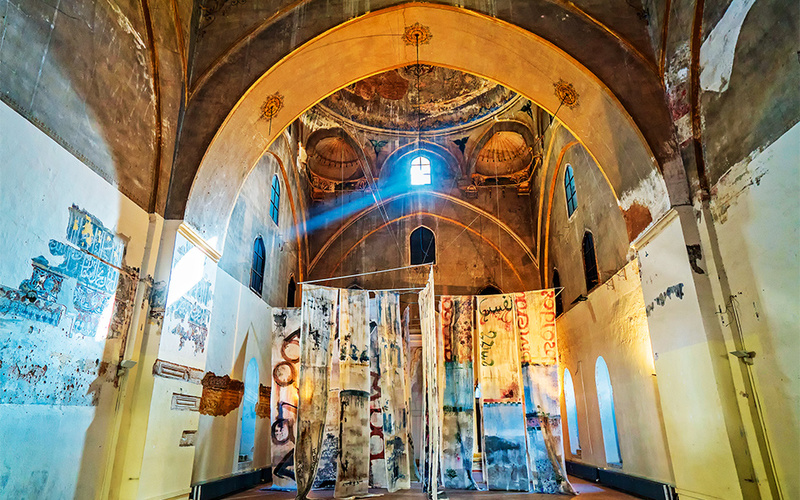 There are exotic traces of the city’s Ottoman past, whispering from a jewel box of a mosque or from the forgotten tourbe (mausoleum) of a Sufi holy man at the edge of a square. Byzantium shines gloriously throughout the city, but most especially in a small church tucked away in a picturesque maze of paths and stairs. 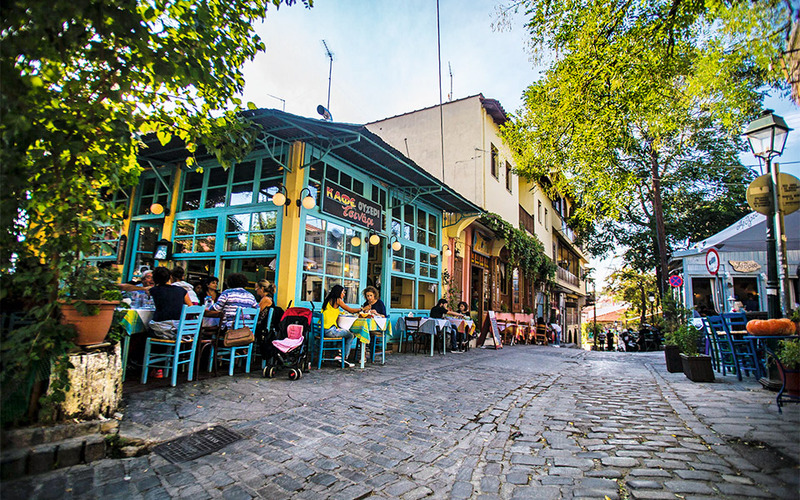 All of this can be found in Ano Poli – Thessaloniki’s “upper town,” a district by turns quiet and lively, youthful and classic. Up here, the past weaves, ever gracefully, in and out of the present, and as it does so, it is seen, sung and tasted. 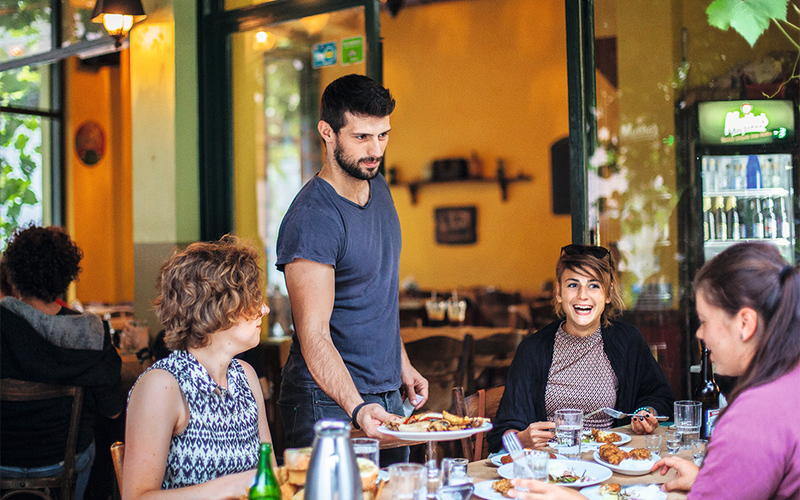 Taverna Igglis is a Thessaloniki classic, a neighborhood favorite for more than a hundred years. These days, the crowd is young. They’re eating fresh interpretations of dishes with traditional roots, seasoned with an eastern zest that is the neighborhood’s enduring heritage. Rebetiko – a richly atmospheric musical genre with its roots in Asia Minor and a philosophy not dissimilar to the blues – is playing. Everyone knows the songs. It’s not about nostalgia. These tastes, these songs never left. In Ano Poli, the city is its most authentic, timeless self. 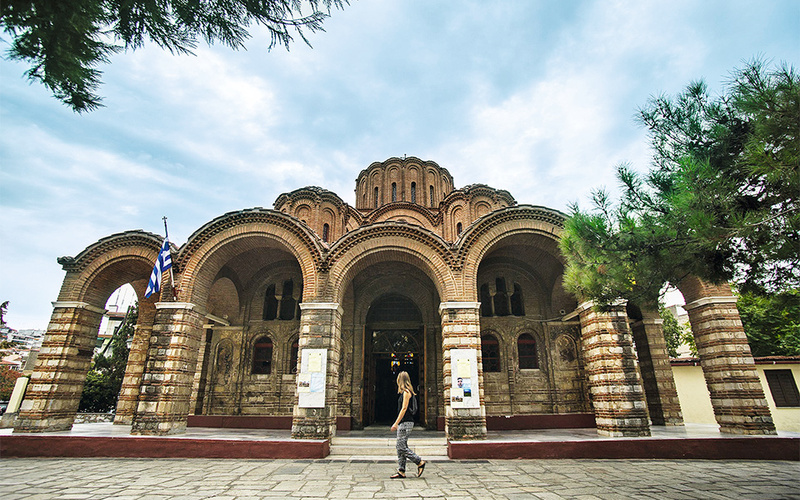 Tsinari, with its peaceful cobblestone streets and charming tavernas, is like a traditional village right in the city. 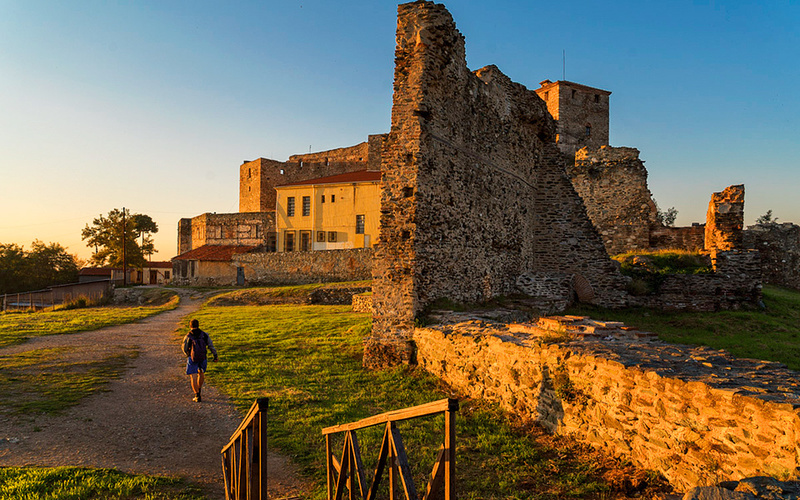 First a fortress, then a prison until late in the 20th c., the Eptapirgio Castle (Yenti Koule) is now a poignant monument, picturesque in the light of the setting sun. 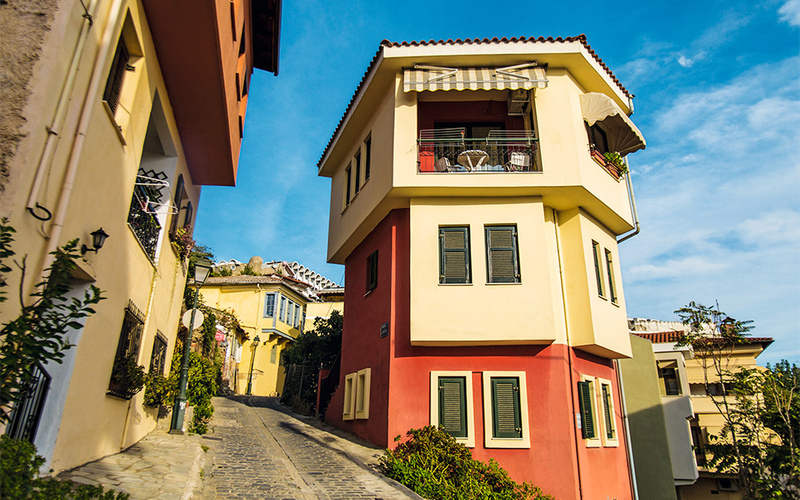 The views and breezes of the upper town made this a choice neighborhood, particularly among the Turkish population of the city. High above the main town, it escaped the Great Fire of 1917 and remains the same enchanting labyrinth that it has been for centuries. The charm of Ottoman vernacular architecture – the partially timbered houses with their cantilevered upper stories – is often beautifully preserved, painted in shades of ochre, terracotta and dusty blue. Those in ruins are just as picturesque – rich in both crumbling architectural detail and in contemporary street art adorning their walls. Older residents help preserve the neighborhood’s intimate character, chatting across narrow alleys from their respective balconies or lowering baskets by rope for their bread and newspapers. 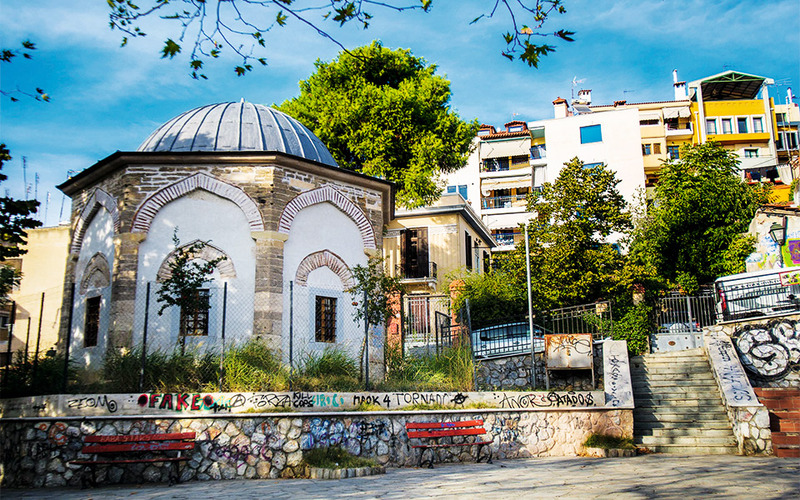 You hear the Ottoman heritage in the names of places like the Alaca Imaret Mosque, the Koule Kafe, the Kipoi tou Pasha (The Pasha’s Gardens) and the Yedi Kule. You see it in the inscription on the Kokkini Vryssi (Red Fountain) on Akropoleos Street or in the characteristic shape of another fountain in Tsinari (a popular and charming corner that takes its name from the Turkish word for “plane tree”). From Mark Mazower’s Salonica, City of Ghosts, we learn that the Tourbe of the Sufi mystic Musa Baba (in Terpsithea Square) remained spiritually significant after the Turks left. Christian women lit candles here, believing him to be the incarnation of St. George. His presence in the neighborhood was vivid – reports of his ghost being seen wandering about the square continued until the 1930s. 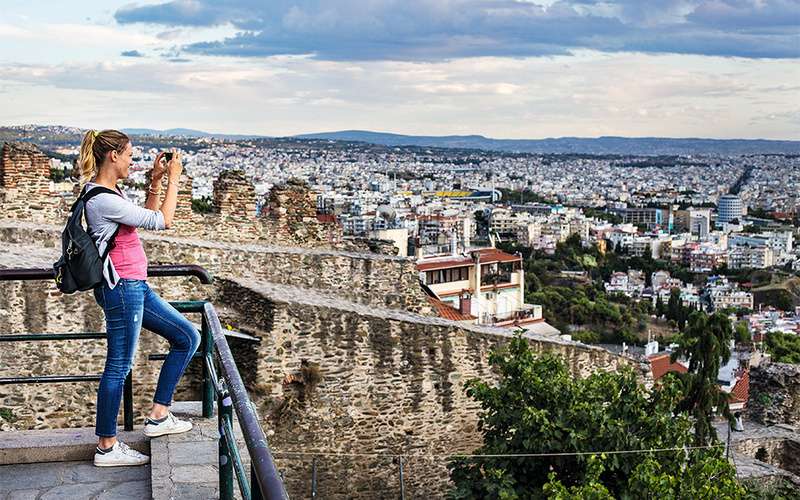 The view of the city and the Thermaikos Bay is at its best from the Byzantine walls of the Upper Town. It’s pleasure enough just to wander off-piste, getting lost among the pomegranate trees and winding cobblestone alleys while taking in the neighborhood. But Ano Poli rewards deeper exploration with moments of rare beauty and discovery. The late 15th-century Alaca Imaret is one such secret. Down the hill to the west, just off a main street but nearly hidden among 20th-century apartment buildings, it’s one of the city’s most sumptuous Ottoman monuments. Its nondescript exterior doesn’t prepare the visitor for an interior with domed ceilings rich with arabesques and trompe l’oeil drapery. Silhouettes of forgotten forests are framed above the arches, and patches of Arabic calligraphy survive on the walls. Now under the auspices of the city’s Municipal Art Gallery, this site hosts exhibitions and events enhanced by its own history and unique character. The earlier, enormously rich, Paleo-Christian and Byzantine eras offer further surprises. Follow the brown signs (they indicate sights of cultural and historic interest) uphill from the “Taxiarchis” stop on the #23 bus-line that runs along Akropoleos to reach a small gate leading to the courtyard of the Church of Osios David. The view alone is worth the trip; however, inside the church, all the mystery and glory of fifth-century Christianity awaits you in a small, dark and deeply contemplative space. The mosaic of the vision of Ezekiel decorating its apse, with a rare depiction of Christ as an adolescent at its center, is utterly captivating. 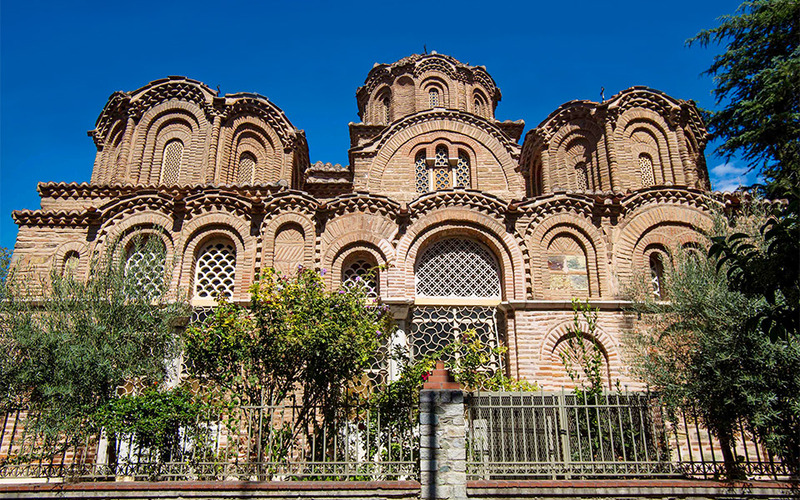 UNESCO considers it a masterpiece of early Christian art. This is just one of Ano Poli’s several UNESCO World Heritage Sites. The 14th-century Vlatadon Monastery, with its peaceful gardens, is close by. 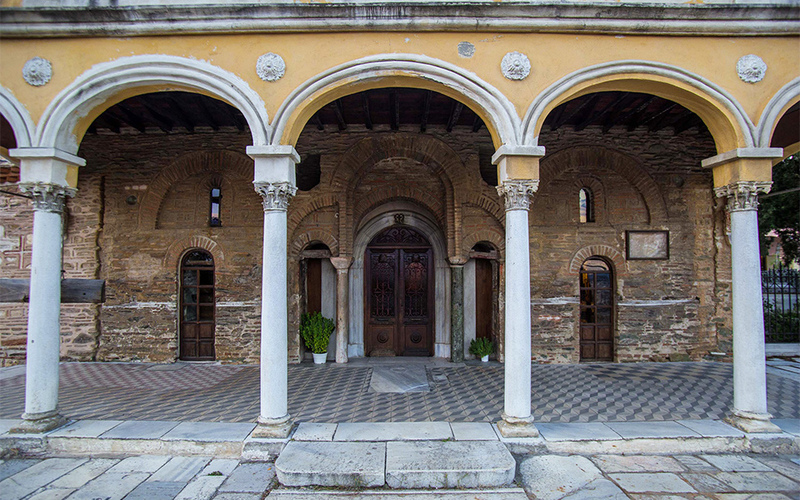 Further down Theotokopoulou, across from the “Koule Kafe” bus stop, is the Byzantine Bath, which served the neighborhood for centuries until its closure in 1940. Following extensive restoration work that was completed in 2015, it is once again open to the public. Off the larger streets bordering the neighborhood’s lower western edge are the Profitis Ilias Church, from the 14th century, and the 13th-century Church of Aghia Aikaterini. 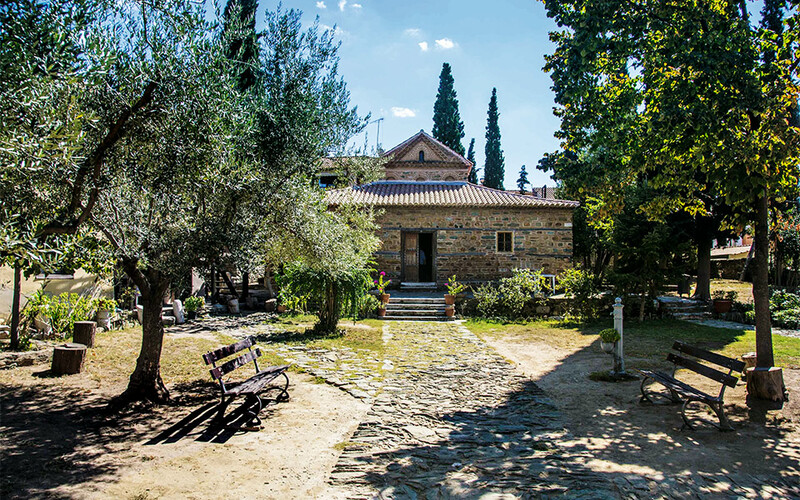 Yet another church among the cobblestone paths of Ano Poli elicits the same sense of mystery as Osios David – the 14th-century Church of Aghios Nikolaos Orphanos. It is prized both for the engaging narratives told by its frescoes (dating from the Paleologian Renaissance) and for its rambling garden. 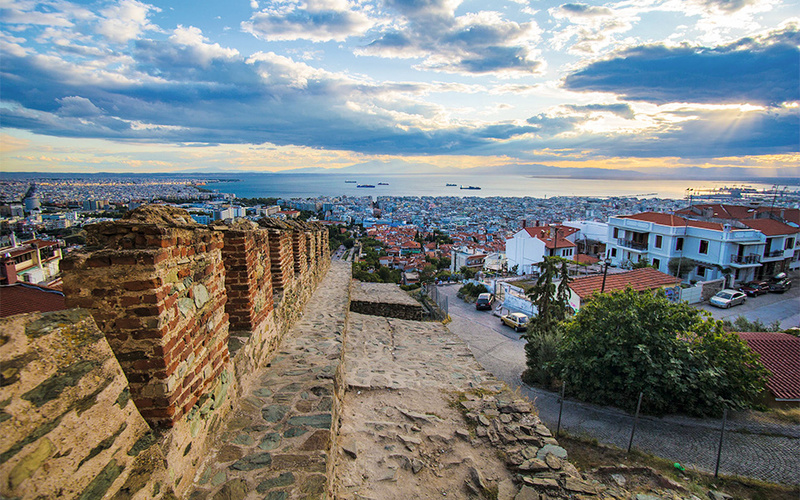 The city walls – which define Ano Poli’s upper edge – are a UNESCO World Heritage Site, too. Even the newer buildings follow the lines and the color palette of the neighborhood’s vernacular architecture. 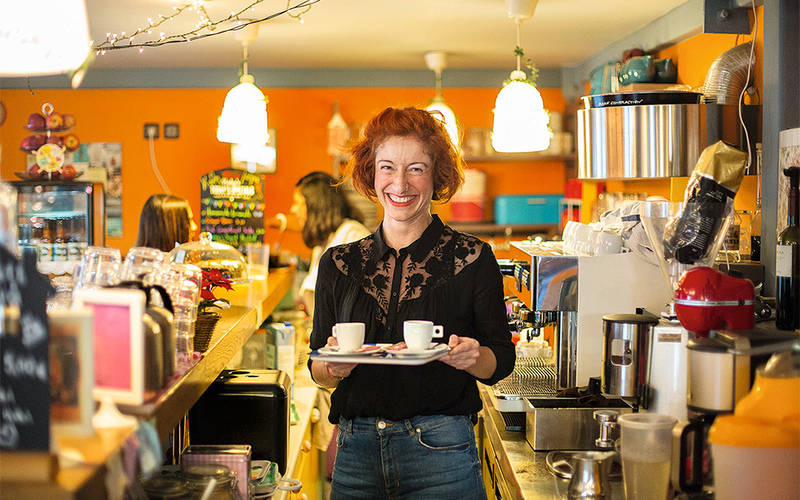 There are plenty of places to stop for a coffee and a bite when touring Ano Poli. Even though it is so densely built, with few formal parks or squares, this most untamed area of the city is also its greenest. Nature thrives unplanned in every corner; the air is rich with the scent of fig trees and jasmine on summer nights, and of wet leaves and wood smoke in winter. 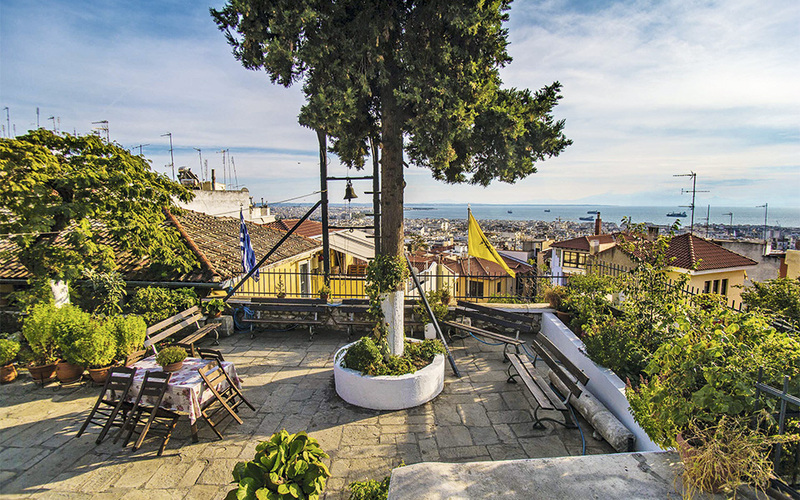 With nearly as many paths and stairs as streets, Ano Poli sounds much like it did 100 years ago – birdsong by day, the strains of bouzouki from tavernas and cafés by night. And if you’re looking for still more nature, you can hike parts of the extensive trail system running through the Sheikh Sou Forest that borders Ano Poli’s northeastern edge. Standing under the Trigonio Tower, once the city’s upper gate, it’s easy to see why Ano Poli was the city’s favored neighborhood for centuries. The forest is to your left and the whole of the Thermaikos Bay is stretched out beneath you. Directly across the water, the majestic peaks of Mt Olympus feel stunningly close. This view is one of the city’s most romantic, and you’ll find as many locals here as visitors. Time your visit for sunset, when the last rays etch the mountain’s silhouette clearly against the sky. Then watch as, below you, the city lights go on and the tower glows gold. 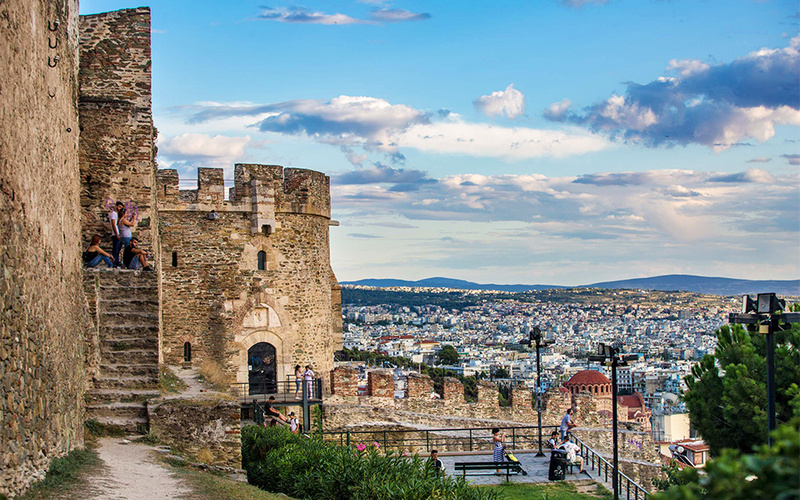 Stay for an ouzo at a café with a view, or do like the students – bring a guitar and a bottle of retsina and spend the evening on the ruins of the wall, under the stars. Take the bus #23 to the stop Moni Vlatadon to visit the monastery of the same name. From there, head downhill, following signs to reach the Church of Osios David. Going down Theotokopoulou by the Taxiarchis Church and continuing downhill, will soon bring you to the Byzantine Bath (just above Olimpiados). From here, walk west on Krispou to meet Fotiou and then go right – it will join Epimenidou, to bring you to Doridos and lead you into Terpsithea Square, where you will find the Tourbe of Musa Baba (right across from one of the grandest houses in the neighborhood). From here, go down Elefsinos to Olimpiados and go right for half a block to the Church of Prophet Elias. From here, continue farther west along Olimpiados to Tsamadou to visit Aghia Aikaterini Church, or follow Aghiou Nikolaou downhill. The Alaca Imaret is just above Kassandrou, between Aghiou Nikolaou and Sofokleous. For a shorter walk, but still one with plenty of neighborhood character, begin at the Church of Osios David, return to Akropoleos and find Ifikratous, which will lead you downhill to Irodotou (passing Taverna Igglis) and continue on Irodotou to the Church of Aghiou Nikolaou Orphanou (look for a gate in the wall to its garden). From here, it’s a short walk to Ano Poli’s lower edge and the Atatürk Museum, on Apostolou Pavlou just above Aghiou Dimitriou. Take a taxi or the #23 bus to the Aghii Anargyroi stop, or, even better, treat yourself to a brisk half-hour hike uphill along Elenis Zographou to reach the Trigonio Tower for a prime view of the city, the Thermaikos Bay and Mt Olympus; for the best results, come in time for the fabulous sunset. Pass through the gates to the old part of town and find Stergiou Polidorou Street (it runs along the city walls) for dinner at Ticho Ticho (that’s the Greek word for “wall” – twice), or wander downhill and a little to the right, exploring along the way, until you come to Taverna Igglis for a lively taste of the neighborhood. 1. The Church of Aghia Aikaterini, Aghias Aikaterinis & Tsamadou (near Olimpiados). Open 7:00-10:00 & 18:00-19:30 (winter hours 7:00-10:00 & 17:00-19:30). 2. Eptapirgio (“Seven Towers” Castle), is popularly known by its Turkish name “Yenti Koule.” A prison until 1989, it is mentioned in many a rebetiko song. Open Tue-Sun 8:00-15:00. Admission is free. 3. Trigonio Tower, Eptapirgiou Street, along the city walls. 4. The Vlatadon Monastery, 64 Eptapirgiou (near Akropoleos). Open 7:30-12:00 & 18:00-20:30. 5. The Church of Osios David, near Epimenidou. Take the #23 bus to the “Taxiarchis” stop and follow the signs. Open Mon-Sat 11:00-15:00, Sun 7:00-12:00. 6. The Tourbe of Musa Baba, Terpsithea Square at Pileos. Open 24/7 (outdoor monument). 7. Profitis Ilias Church, Olimpiados near Sakellariou (near the Tourbe of Musa Baba). Open 8:00-12:00 & 17:15-19:00 (winter hours 8:00-12:00 & 16:00-18:00). 8. The Alaca Imaret, 91-93 Kassandrou, between Sofokleous and Aghiou Nikolaou. Open Tue-Sun 11:00-18:00. Admission is free. 9. Byzantine Bath, Theotokopoulou at Aristippou (just above Olimpiados, directly across from the “Koule Kafe” stop on the #23 bus-line). Open Tues, Wed, Fri 10.00-13.00. 10. The Church of Aghiou Nikolaou Orphanou, 1 Irodotou. Open Tue-Sun 9:00-15:00. 11. The Atatürk Museum, entrance on Isaia at Apostolou Pavlou, near Aghiou Dimitriou. Open Tue-Sun 10:00-17:00. 12. 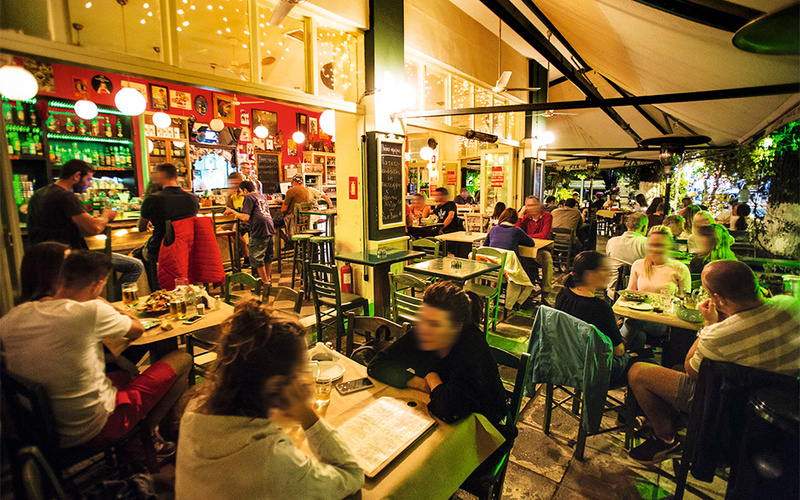 Taverna Igglis, an old neighborhood classic with young owners and a lively atmosphere, at 32 Irodotou. Tel. (+30) 2313.011.967. 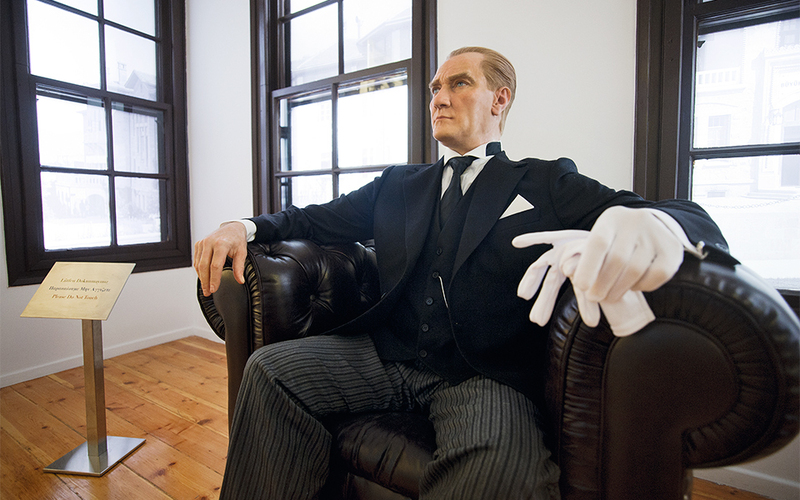 Open daily 12:30-00:30. 13. Ticho Ticho, for inventive meze in a pleasant space with plenty of outdoor tables and a view of the old city walls. Friendly atmosphere and prices. 1 Stergiou Polidorou at Agrafon, near Akropoleos. Tel. (+30) 2310.245.351. Open daily 09:00-01:00.